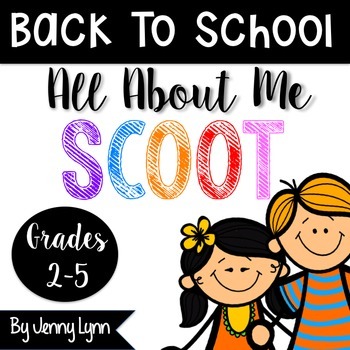 All About Me SCOOT is a fun, interactive activity that lets you get to know your new kiddos that first week of school! Perfect for all ages and grades! *Great used for SCOOT, Around/Work the Room, or put on rings to use in a station/center. 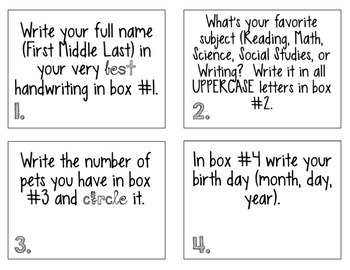 *For best results print out on colored card stock and laminate for future use! Looking for problem solving products? Click on the links below! •	Look for the green star next to my store logo and click it to become a follower. Voila! You will now receive email updates about this store. I value your feedback greatly as it helps me determine which products are most valuable for your classroom so I can create more for you. ©Jenny Lynn. 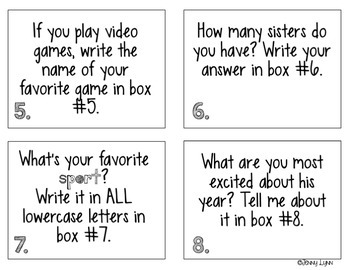 Please note - this resource is for use by one teacher only. Additional teachers must purchase their own license. You may not upload this resource to the internet in any form. Thank you for protecting my work.